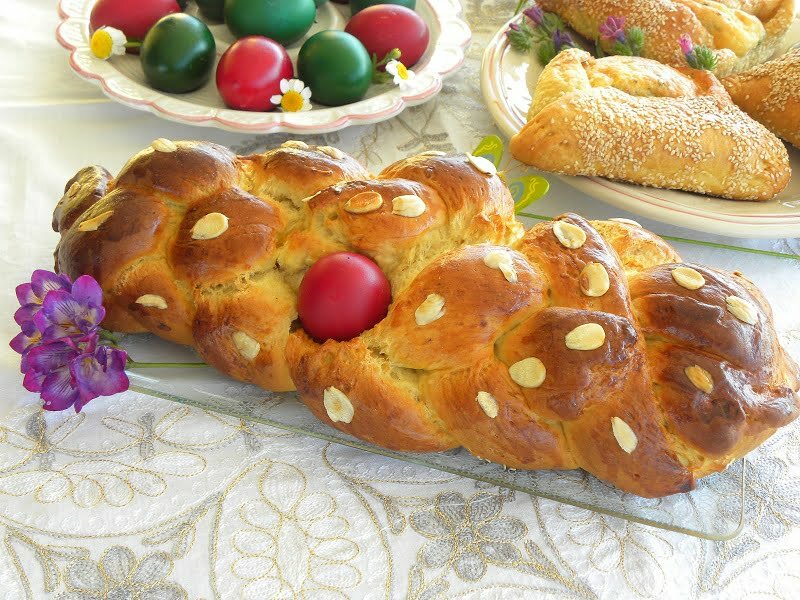 Tsourekia (singular tsoureki) pronounced tsou-RHAE-khia, is a kind of brioche sweet bread which is made in Greece during Easter. In Cyprus we did not use to make tsourekia, so this is something I have learned after coming to Greece. The other day I was looking through my old note book with recipes and I found this magazine clipping which I had glued in the note book many years ago and I decided to use this as a base. The only flavourings in this recipe was lemon rind and anise seeds. I added cardamom, mahleb and mastic resin, which is common to use in tsourekia and I filled it with marmalade and merenda (Greek type of nutella) and sprinkled almonds on top. The amount of flour given in the recipe was not enough and I adjusted that. I used three fillings to see which one would work best. One was with my strawberry jam and it was very good, the other with merenda (the equivalent to nutella) and that was very good as well and the third was with my lemon marmalade I made the other day and the result was extraordinary. (Hopefully I shall post about this soon but this week I will be posting mostly recipes having to do with Easter, so if any one wants the recipe soon I can e-mail it to you). Needless to say that there were none left in less than 24 hours but next week I shall make a double dose only with the lemon filling. These will be perfect for breakfast. In the video that follows you will see a new technique of braiding tsoureki with six cords. The cords are not filled with anything but if you want to fill them, just follow the instructions below. In a small bowl add a few spoonfuls of flour in which mix the yeast and sugar and then mix with lukewarm milk. Cover with lid and leave to rise (about half an hour). Until this is ready, boil the water with the anise seeds and drain keeping the water. Grate the lemon, pound the cardamom, mastic gum and the mahleb and blanche and cut the almonds. With a hand mixer beat the butter and sugar until white and fluffy. In a big bowl put the flour, reserving about a cup, and add the yeast, the eggs, the salt, the cardamom, the mastic and mahleb and lemon rind as well as the butter-sugar mixture and mix, adding the lukewarm anise water. Knead with your hands until the dough does not stick on the bowl or your hands. Cover the bowl with its lid and place it in a baking tin with lukewarm water and leave it for about an hour to rise and double in volume. Knead again a couple of times and take three pieces the size of your fist. Roll out into rectangular sheets about 5 x 3 inches and add either jam or any other filling on one side and then make a roll and with your hands try to make each roll a little bit longer. When all three are ready stick the ends together and form into a plait. Line a baking tin with parchment paper and place each plait in it but not too close to each other. Cover with cling film and then cover with a napkin and it must rest to rise for about an hour, in which time it will rise again. You can also make one big roll and just give it a simple twist. Brush with the egg-milk mixture on top and sprinkle some sugar and some blanched almond flakes. Preheat oven at 180ο C and bake for about 30 – 40minutes or until golden brown. Note: Without the filling it is not sweet so if you do not want to add the filling you can add ½ cup of extra sugar in the butter. The recipe I made last year with the six cords was slightly different from the above and it yielded 3 tsourekia. This year I made the same recipe but each piece was weighed at 450 grams. I made a big cord which I cut into three pieces and I made the simple braid. It yielded 8 tsourekia. Prepare the starter. Add the yeast, sugar, flour and enough lukewarm water to make a thick batter. Cover the bowl with a napkin and let it rise. Put both butters in a pot and warm it up until it melts. Add the milk and sugar and mix until the sugar dissolves. Do not overheat as it should be lukewarm. Put the eggs in your stand mixer bowl and using the K beater mix until incorporated. Add the butter-milk-sugar mixture and mix. Add the starter, the flour, mahleb, mastic powder, cardamom powder and salt and mix. Change the K beater with the hook. Finally gradually add the anised water, a little at a time until the dough holds together. You may not need all the water. Set the dough aside, covered, and let it rise. Knead the dough for a few minutes and divide it into 8 pieces of 450 grams each. Make a long cord and cut it into three equal pieces. Form them into a braid. Cover the braids with a napkin and let them rise. Put the yolk in a bowl with some sugar and blossom water and mix to dissolve the yolk. Brush the tsourekia with the egg wash and add some almonds on top. Preheat the oven to 190ο C. Lower the heat to 180ο C or 160ο C if fan forced and bake for about 45 minutes, or until golden on top. Nice tsourekia Ivy. I’m in the middle of making mine as we speak and I think the recipe I followed had too much flour! Subsequently it’s a bit “stiff”. I made mine with portokali and I am trying to rescue them! If all fails then I’ll do them again tmrw. Nice touch with the marmalade filling. Good luck Peter. The dough must be a bit stiff, I don’t know how much stiff yours are but I think they should turn out fine. I look forward to seeing your recipe. Thanks Cakelaw they were delicious. Hi Ginny, thanks for passing by. It’s not exactly a bread, it’s more like a bun and it is not usually filled but traditionally it is decorated with a red Easter egg. Sorry I didn’t mention this in the post. Mastic gum or raisin comes from a tree that grows on the island of Chios. They tried to cultivate it in other parts of the world, even other parts of Greece and the tree will not produce the gum elsewhere. I am waiting for my tsoureki dough to finish rising as I write this! From what I know, Gemisto Tsoureki is a specialty of “Attiki” or Attica in English… Good job! Good luck Sam, I am looking forward to seeing your recipe. Wow Ivy! you keep on surprising me, you are such a great cook! Your family must be soooooo happy :D! Your Tsoureki looks amazing, so beautifully done, and the inner part so well cooked. Bravo! This looks so delicous too ivy. I will make them oneday, but then i thinl i will do the nuttela filling as my daughter would love them. I have no idea what mastic gum is can i replace with anything else. My daughter also loves them with nutella. Mastic resin is a Greek spice which is very aromatic. You can surely omit it or substitute it by another flavour. I guess I will omitt them as I am sure i would not find them here. Did you make the braided one with the whole dough? HC it’s okay if you omit it. I made about ten tsourekia not very big though. It would make about 5 big ones.